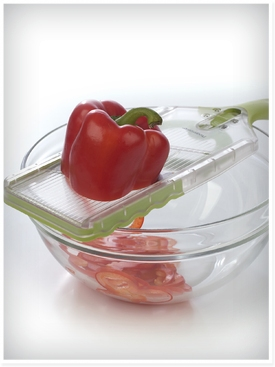 Get perfect even slices with the Progressive International Adjust-A-Slice Mandoline. No more struggling in the kitchen with a knife to get slices like a chef. Select your desired thickness with the mandolin slicer�s easy adjustment button and slice away with carrots, onions, zucchini, tomatoes, kiwi and apples. Wider slicing surface will accommodate larger produce. Sliding button adjusts between 3 thicknesses: thin, medium and thick. Slide button down to lock for safe cleaning and storage. Angled blade provides more efficient slicing. Non-skid base and ridges keep mandoline slicer stable on cutting surface and allow for use over a bowl.